John “Jack” Edward Frederick Mueller, 94. of Norwood Young America, formerly of Hamburg, died Monday, Jan. 22, 2018, at New Perspective Senior Living in Waconia. Honorary casket bearers were Katie Mueller and Charity Kranz. Casket bearers were Joe Mueller, Tim Mueller, Karl Kranz, Luke Zabel, Ben Otto and Pat Otto. Interment was in the church cemetery. John “Jack” Mueller was born Dec. 23, 1923, in Hamburg, the son of John H. and Helen (Oelfke) Mueller. He was baptized as an infant on Jan. 6, 1924, and was confirmed in his faith as a youth on March 21, 1937, both by the Rev. Baumann at Emanuel Lutheran Church in Hamburg. He graduated from Central High School in Norwood Young America with the class of 1942. On May 9, 1948, he was united in marriage to Dorothy Prehn by the Rev. C.E. Mix at St. John’s Lutheran Church in Plato. They made their home in Hamburg until 2014, when they moved to Peace Villa in Norwood Young America. Their marriage was blessed with a son, Larry, and two daughters, Joyce and Karen. The couple shared over 67 years of marriage before Mrs. Mueller’s death on March 3, 2016. Mr. Mueller owned and operated a grocery business in Hamburg, which was previously owned by his father and grandfather. Together with his wife Dorothy, they maintained the business until retirement in 1986. Mr. Mueller was a lifelong member of Emanuel Lutheran Church in Hamburg, where he served on the church council, as a church elder, and as a head usher. 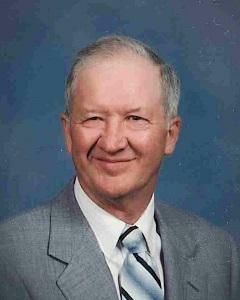 He enjoyed singing and for over 40 years was a member of both the men’s choir and the mixed choir. He also served on the Hamburg Fire Department for 22 years. He was a lefthanded pitcher for the Hamburg town team, a past member of the Hamburg Baseball Club and served on the Hamburg Town Council. He loved to compete in bowling, whether it was in men’s bowling leagues and tournaments or bowling mixed doubles with his beloved wife Dorothy. He also liked to play cards, dance a polka or waltz, and take trips with family and friends. He was a dedicated Minnesota Twins fan, supporting them through years of triumph and years of defeat. He rarely missed watching a game. He had a wonderful sense of humor and lived life embracing it in a positive light. He treasured his family, and his greatest love was time spent with them. He was the biggest fan at his grandchildren’s school and sporting events, and his great-grandchildren always brought a proud smile to his face. Deeply loved, he leaves behind a priceless collection of memories his loved ones hold dear to their hearts. He is survived by his son, Larry Mueller and his wife, Barb Peterson, of Eden Prairie; daughters, Joyce Zabel and her husband, Bob Shanahan of Norwood Young America and Karen Otto of Waconia and her friend, Bill Sletten, of Otsego; grandchildren, Joe (Meg) Mueller of Shakopee, Tim (Megan) Mueller of Edina, Katie Mueller of Edina, Charity (Karl) Kranz of Lexington, Kentucky, Luke (Amber) Zabel of Gresham, Oregon, Ben Otto of Waconia and Pat Otto of Waconia and his special friend, Hania Pokora, of Edina; great-grandchildren, Kaylee Otto, Brayden Otto, Braxton Otto and James Mueller; sisters, Doreen Kloth of Eden Prairie, Gloria Trittabaugh of Hutchinson and Helene (Delford) Olson of Bemidji; sisters-in-law, Luella Prehn and Orvilla Prehn, both of Glencoe; nieces, nephews, other relatives and many friends. He was preceded in death by his parents, John and Helen Mueller; wife, Dorothy Mueller; son-in-law, Bob Zabel; sister and brother-in-law, Marvel and Frank Holicky; brothers-in-law, Stan Kloth, Glen Trittabaugh, Harold Prehn and Marvin Prehn; and sister-in-law, Lorna Matthews. Arrangements were with the Paul-McBride Funeral Chapel in Norwood Young America. Online obituaries and guest book are available at www.mcbridechapel.com.